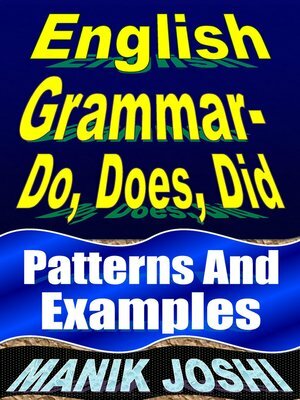 This Book Covers The Following Topics:English Grammar- Do, Does, DidDedicationCopyright NoticeEnglish Grammar – 'DO/DOES/DID'English Grammar – 'DO'VERB 'DO' — (A) – Affirmative SentencesVERB 'DO' — (B) – Negative SentencesVERB 'DO' — (C) – Interrogative SentencesVERB 'DO' — (D) – 'Short Answers' and 'Question Tags'English Grammar – 'DOES'VERB 'DOES' — (A) – Affirmative SentencesVERB 'DOES' — (B) – Negative SentencesVERB 'DOES' — (C) – Interrogative SentencesVERB 'DOES' — (D) – 'Short Answers' and 'Question Tags'English Grammar – 'DID'VERB 'DID' — (A) – Affirmative SentencesVERB 'DID' — (B) – Negative SentencesVERB 'DID' — (C) – Interrogative SentencesVERB 'DID' — (D) – 'Short Answers' and 'Question Tags'Exercises: 1(A) and 1(B)Exercises: 2(A) to 2(D)Sample This:English Grammar – 'DO/DOES/DID'Verb 'Do' is used as an AUXILIARY VERB as well as an MAIN (ORDINARY) VERB.MAIN VERB: When used as main verb, verb 'do' is followed by an object.AUXILIARY VERB: 'Auxiliary verb' is a verb which is used with main verb to show tenses, etc. ]He does not do these kinds of things. [In this sentence, 'Does' has been used as an 'Auxiliary Verb', while 'Do' has been used as a 'Main Verb']They do not do nation-building. [In this sentence, 'Do' has been used as both an 'Auxiliary Verb' and a "Main Verb']NOTE: Verb 'do' has the following forms:(1). Present form – Do or Does['Do' is used with 'You, I, We, They' and all other plural subjects in present tense. 'Does' is used with 'He, She, It' and all other singular subjects in present tense.](2). Past form – Did['Did' is used with 'You, I, We, They, He, She, It' and all other singular and plural subjects in past tense.](3). Past Participle form – Done[Past participles are accompanied by auxiliary verbs 'HAVE' or 'BE' (in the correct tense)]You have done your country proud.This type of job is done in this factory.Main Verb 'Do' may denote the following actions –to find the answer to something: - Can they do this puzzle?to perform an activity or a task: - Sometimes you like to do things that are a little scary.to produce something: - He did a painting last night.to study something: - I am doing English these days.to talk about household chores (cleaning, washing, etc. ): - They will have to do (wash) dishes.to work at something as a job: - What do you do for your livelihood?Main Verb 'Do' is also used to show the following actions:to attend, to cook, to copy somebody's behavior, to travel, to visit somewhere as a tourist, to cheat, to punish, to steal, etc.Some more sentences with 'MAIN VERB' – DO/DOES/DID/DONE:She is happy that she will be able to do something for the poor and downtrodden.We are ready to do whatever it takes to avoid being suspended from competition.I like to do extensive research before I invest hard-earned money on a new purchase.It's no secret we do things we know we shouldn't.It is not uncommon to come across people who do jobs that have nothing to do with their academic degree.What ultraviolet light does to skin to cause sunburn?What caffeine does to your brain?It is not yet clear what exactly this software did.Work was done according to the rules.He has done an obligation to me.